Cpl. Floyd E. Nicholson, son of Mr. and Mrs. Joe Nicholson, graduated from Manitou School. 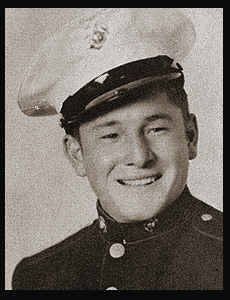 Entered Marines in Nov., 1942, trained in San Diego, Cal., Ft. Knox, Ky.; served in Pearl Harbor, Tinian, Saipan, Okinawa, Aguina; was wounded in action in Okinawa in June, 1945; is now on duty in Japan. Awarded the Purple Heart, Silver Star, Good Conduct Medal, Asiatic Pacific Ribbon.